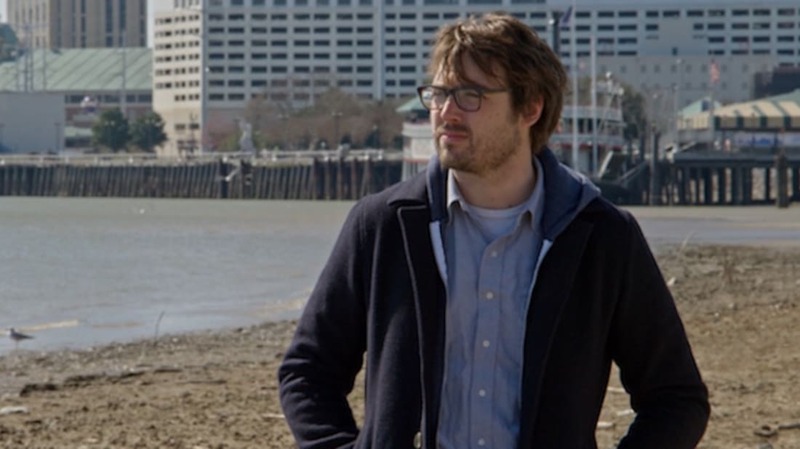 Jonah Ray has made a career out of poking fun at pop culture. In the past decade, the stand-up comedian has worked behind the scenes (as a writer and/or producer) on hit projects like The Rotten Tomatoes Show, SuperNews!, and The Soup. He also co-hosts the weekly live comedy show-turned-Comedy Central series The Meltdown with Jonah and Kumail with Silicon Valley star Kumail Nanjiani. But he’s just getting started. On June 2, Ray’s new travel show, Hidden America, made its streaming debut on Seeso. Except it’s not a travel show at all. Well, not really. A send-up of the “dude travels to a new city, meets some locals, and eats strange food” series that now seem to occupy half of every channel’s programming schedule, the comedic series sees Ray traveling all across the country to uncover untrue facts about each new city he visits. While viewers are already raving about Hidden America, which is produced and directed by Troy Miller via Dakota Pictures, Ray is hard at work on his next big project: taking over hosting duties on the upcoming Mystery Science Theater 3000 reboot. mental_floss chatted with Ray about fake facts, drinking beer with Kim Jong Un, and what we can expect from the new MST3K. So let’s talk about Hidden America: It’s a fake travel show, but its foundation lies in what is a very real moment in travel television programming right now with shows likes Parts Unknown. How and when did the idea for the show originate? I kind of had this inkling of an idea of a travel show, because I was obsessed with Anthony Bourdain. I love Bourdain’s shows so much, both No Reservations and Parts Unknown. I watched those shows all the time and I loved that they took such a cinematic approach to making these shows. And then, of course, there are all the other ones that are just no good. Bourdain kind of nailed it and yet there are all these other guys who think they can do the same thing and that’s what I love. I love the narcissism of these guys who think they can also do what Bourdain does. And that’s kind of where I had this idea in my head. And then I saw the Alan Partridge special Welcome to the Places of My Life, which is this brilliant special Steve Coogan did under the character Alan Partridge. I was just kind of like, “I should do like a travelogue-style show.” I loved the idea of a guy that’s no good at something trying so hard to be cool and be intellectual. So many of these travel shows are doing the same thing, which isn’t really even traveling so much as sending some guy to a city and forcing him to eat elephant testicles. Exactly. I would like it more if they shot it well. Just give us some nice deep focuses on those elephant testicles. For you, what’s the absolute worst trend in travel television right now? The thing that you really wanted to replicate with Hidden America? I wanted to replicate the personality type that does the travel show more so than the specific travel shows. I do like the idea of someone going, “To find out about a place, you need to talk to the people.” Because any time you go to any city, every person you talk to is going to have a different take on that city. And I hate the idea of, “We’re going to go here and we’re going to have a disgusting meal because it’s what real people eat!” Fried food and this and that, and it’s always so condescending. You really did travel to each of the places you showcase in the show. How did you prepare for each episode? We wrote as many fake facts as we could with what we knew. I didn’t want any of the writers really digging deep into any actual facts. I wanted to have a real surface-level amount of information and then just drive it home as if you’re an expert on the topic. That’s my favorite kind of stuff. Like in the New Orleans episode we say Fat Tuesday started as the eradication of overweight residents, but has since grown into this celebration of sorts. I like fake facts a lot. I’m a big fan of that stuff. We knew these real surface-level things, but we didn’t want to know much else than that. Are you someone who likes to travel? I imagine you do a lot of it for your work, but is it something that you enjoy doing in your free time? I love traveling. I grew up in Hawaii, which is a travel destination in itself, but I never got to go on road trips growing up. I never got to really see a lot of what we call “the mainland,” so the ability to see these small towns or small cities—it’s stuff that I saw on TV and movies growing up that look nothing like what I was used to in Hawaii. So I love being able to travel. But I don’t like the process of flying, because I’m 6-foot-5 and it is a huge inconvenience to get on a flight. It’s not comfortable at all and if I want to sit in a seat that has room for me I have to pay extra, which seems to be kind of insulting and discriminatory, but what are you going to do? For you, who’s the worst kind of traveler? There are the obvious ones, like the chair kickers and the person who leans back and crushes your laptop and inner organs. Who’s the worst person on the plane? Chatty people. The people who don’t know when to end the conversation, or they start the conversation right when you sit down and they kind of keep it going. For me, plane time is a time to just shut down and catch up on some movies. I don’t like not being able to just walk away from a conversation. I mean, you’re on a plane and you can’t go, “Oh, hold on. I’ve got to make a phone call.” You can’t do any of that stuff. Unless you want to be in the bathroom for six hours. Exactly. The only time I really liked someone who was talkative with me was when I had just gone through a ridiculous breakup the day before and was just in complete emotional distress. And this old lady asked me how I was doing and I just told her about the entire breakup, and she talked to me about it the entire time. So, in that case, I was what I hated. She’s probably still telling people about it, and hasn't flown since. What’s the one American city you think everyone should visit at least once during his or her lifetime? Oh, man that’s a tough one. It’s a toss-up. Austin is my favorite city, just because it’s fun and it’s a great little area of the country. And I have an affinity for Seattle. But I would say New Orleans, because it’s essentially our Montreal. It’s our kind of “foreign city” existing within our continent in this country. I’ve never seen or heard or even smelled anything like New Orleans. How did you decide on which cities to feature on the show, or did the location itself not really matter so much? A lot of it was that it had to have a lot of visually stunning things we could catch. What’s kind of got these big things that everyone knows about that we can then subvert or comment on within our ideas for scenes and sketches. We also didn’t want any of the cities to be too similar; we had Nashville on our list, but it was a bit too similar to stuff we would probably do in New Orleans or Austin, so we wanted to avoid it for this season. We wanted everything to have a different feeling. We almost did San Diego, because it would’ve been really cheap to do L.A. and San Diego, but they would’ve been too similar. They’re too sunny. And we wanted each episode to have a stark contrast from the one before it. I also really wanted to do Reno because I think it’s the most depressing city in the world, but none of the writers had really been there before and it was kind of hard to describe how sad it is. What’s the atmosphere like when you’re shooting? The show is obviously very carefully produced and scripted, but do you leave a lot of room for improvisation or happy accidents? Oh, yeah. I think that’s really key when you’re shooting comedy. You want to do two cameras. You want to do cross-coverage. Because when an idea is in your head it’s perfect, and then you start writing it down and, every step of the way, it gets ruined a little bit more from what it was in your head. We had a scene written for our New Orleans episode that was completely different from what we ended up improvising and finding within the scene because we had such a great improviser, Chris Trew, in there … You never want to expect that to happen though, because then you’ll really run into some dangerous territory. Since the show is being distributed online, did that give you a lot more freedom in terms of how far you could push things in what you can do and say? Seeso was really great. We didn’t really have to worry about sponsors or commercials pulling out or anything like that because it’s a paid service. So, like HBO or any other paid network, we were able to kind of do what we wanted. They only backed out on a couple of things and that was a little kid having a semi-automatic weapon and me wearing a Nazi uniform, which are totally understandable and very separate bits. When it comes to comedy, for you personally, where do you draw the line between what’s funny and what’s over the line? Do you have any rules or parameters for yourself? I try not to. But I’m not the one to say where the line is. I’m an upper middle class straight white male. It’s not my place to say that something is too offensive. I just kind of have to go as far as I think is funny and wait for the slap on the hand, which could easily happen in our L.A. episode, where I say a couple of horrible things. But it’s one of those things where it’s not for me to say. I’m the man. I’m the problem. I’m not allowed to say what’s acceptable and what’s not acceptable. You started your career as a musician, correct? Well, to say “career” and “musician” is a misnomer. I was in some punk bands where I lost a lot of money and brain cells. But yeah, I started playing in music—punk bands—growing up until I was about 19. Which audience is a tougher crowd: a comedy audience or a musical audience? Comedy, because a music crowd can be there and not pay attention, and so it doesn’t really matter how you do. Some people are just going to be there drinking and talking with their friends. The comedy crowd is there and they’re paying attention. And if they’re not giving you anything and they’re paying attention, that’s the most hurtful blade of them all. Who are the comedians who first or most inspired you? Mel Brooks, Joel Hodgson, Weird Al Yankovic, and Norm Macdonald. Because you brought up Joel, I get to talk about Joel. Believe me, all I want to do is talk about Mystery Science Theater. Even if I didn’t have the job, it’s all I’d be talking about anyway. I’m sure there’s a lot you can’t tell me, which is exactly the stuff I want to know. Tell me everything you can and cannot tell me about Mystery Science Theater. You have to pay attention to every detail, including the stuff that people aren’t noticing. How many times, on average, do you have to watch a single movie to finish the writing process? The way we’ve been doing it is we get together and we just kind of slowly trudge through about 10 minutes and that’ll probably take us about five hours. And that’s kind of going through it, writing riffs for 10 minutes, going back and fitting them in, and then going back and trying to pick the ones that we like and that are also different enough. You can’t have a bunch of jokes in a row where it’s us doing one of the character’s voices. Sometimes it has to be a comment joke. And you’ll be at the MST3K reunion show this month? Man, I’d be there even if I wasn’t performing. That thing is going to be so crazy … RiffTrax just put out a shirt with my name on it and I started to cry. Going back to Hidden America: People keep comparing you to Anthony Bourdain. He just drank beer with Obama in Vietnam for his show. How are you going to top that? We’re going to drink beer with Kim Jong Un in South Korea. How about that? Can’t wait to do that next season. Hidden America is currently streaming on Seeso.